As a beauty blogger, I am regularly trying out different ranges of shampoos and conditioners. Some of them I like, some I don't get along with, but it's pretty rare for me to fall in love with a range so much so that I'm like 'I need to go out and stock up on this, now!' 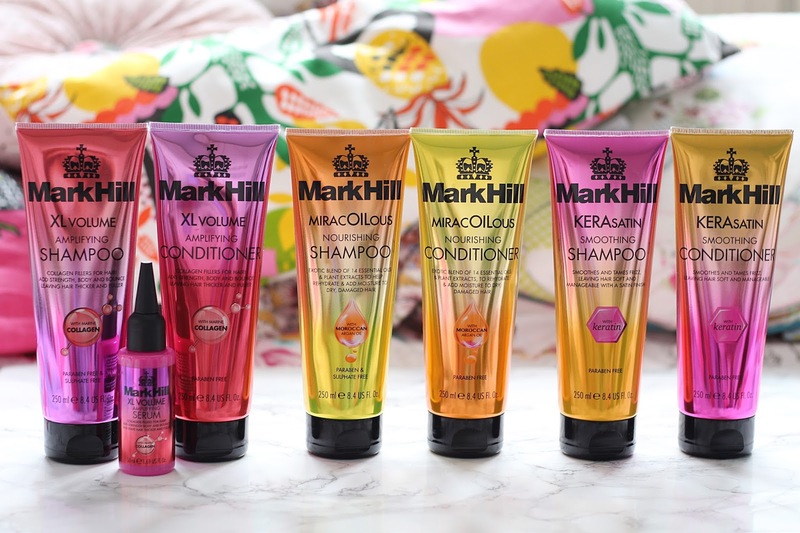 After trying out the new range of Mark Hill haircare, however, I can honestly say I'm in love - and will definitely be repurchasing! Mark Hill had a bit of a makeover fairly recently - with a new range of haircare products, electric appliances as well as super bright, stand-out packaging, the range is certain to get your attention. I tried out the haircare range in particular - which includes Amplifying, Nourishing and Smoothing shampoos and conditioners, as well as a serums, a primer, oils and hairsprays. I was going to run through each of the products individually, but to be honest, I feel very much the same about them all - they're just FAB. The Nourishing and Smoothing ranges are very similar, both leaving your hair feeling and looking incredible. I have very dry, damaged hair, and these two beauties did my hair the world of good. If you're looking for smoothing frizz and achieving uber shiny hair, I'd say opt for the Smoothing range, whereas if your hair is in desperate need of some hydration, opt for the Nourishing. The Amplifying range is another favourite as it definitely boosts volume, as well as leaving your hair feeling silky soft and smooth. I didn't notice a huge boost using the Amplifying Serum, but I don't tend to find volume-boosting serums work all to well on my hair. Overall I am completely obsessed with this range and can't recommend it highly enough. Considering my hair very rarely feels soft after a wash, these made it feel so beautifully soft and healthy, I just couldn't get enough of them. The only downside is they are perhaps a little bit on the pricey side in comparison to my usual shampoos and conditioners of choice, coming in at £6.99 each, but they are totally worth it for how great they leave your hair feeling. Also - they're currently on offer at Boots so you can get them for the bargainous price of £4.66 - go, go, go! Have you tried any of the new Mark Hill products? Let me know what you thought!